Guests were treated to a barbecue buffet that was sponsored for the 10th year by Allpoints Surveying Group with Jeff Solomon and Megan Padua overseeing the lunch. Representatives from the charities, the GHBA and the builder/developer teams showed their appreciation of the record donations by saying a few words. Speakers were Lee Kirgan with Operation Finally Home; Salty Thomason with HomeAid Houston; Casey Watts Morgan and Bo Butler with GHBA; Tim Johnson with Land Tejas and Patrick Mayhan with Westin Homes. "Westin Homes has enjoyed participating as builder captain for the GHBA Benefit Homes charity fundraiser this year," said Mayhan. "It's such a tremendous opportunity to be able to provide funding to two outstanding organizations like HomeAid Houston and Operation Finally Home, through the construction and eventual sale of this new Westin home. We are extremely grateful to all of our vendors, suppliers, and trade base that generously gave financially towards this project." 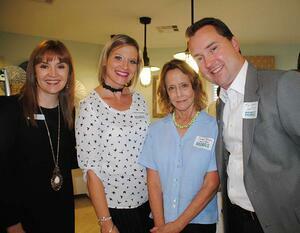 Westin Homes has completed their Carter III plan for this 37-year-old GHBA fundraiser. The home includes five bedrooms (with two on the first floor), 4½ bathrooms and a two- car garage home with 5 additional feet. The foyer offers a view of the triple-tiered rotunda ceiling and curved stairway. The home includes a formal dining room, study and a two-story family room that features a wall of windows. The epicurean island kitchen with upgraded cabinets and breakfast area is the heart of the home. The private master suite includes a double-tiered tray ceiling with no bedrooms above for a peaceful setting. Upstairs is a game room and adjacent media room. This is the second Benefit Home that Westin Homes has built and the Lago Mar homesite was the 15th donated lot by Land Tejas Cos.
"This new record for vendor, supplier and trade donations is quite an accomplishment," said Will Holder, chairman of the Benefit Homes Project. "Their vendors and trades step up when Westin asks for assistance, and that is a testament to the partnerships Westin establishes with their crew. Congratulations to the entire Westin team for a job well done!" For more information on the Benefit Homes Project call the Greater Houston Builders Association at 281-970-8970.